Polaroid Snap It - See It Ad 1957 This is an April 15, 1957 advertisement. It is a nice black and white ad from Polaroid Land Camera Shows a picture of Father, Mother, Son and Daughter and it reads, ""Uncle Ed took our picture with the Polaroid Land Camera. Seconds later we knew that it was perfect."" In excellent condition. Photo is taken through plastic and may show wrinkles or crookedness that is not in the ad. This magazine tear sheet measures 10 1/4"" wide by 14"" tall. 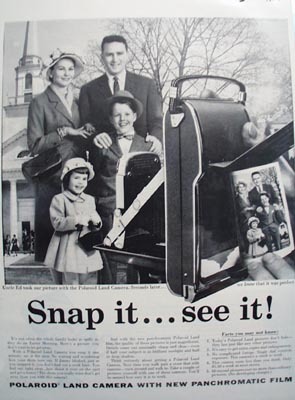 Items Similar To "Polaroid Snap It See It Ad 1957"